A five-year renovation of London's King's Cross Station is now complete and the glorious new hub will formally open to the public on March 19th. Designed by John McAslan + Partners, the renovation was a three part project that included a re-use, a restoration and a new build. The train shed and range buildings were adapted and re-used, the station’s previously obscured Grade I listed façade has been delicately restored, and the new Western Concourse is the showcase of the project. The semi-circular concourse also features a 150 meter free spanning roof that floods the space with natural daylight. 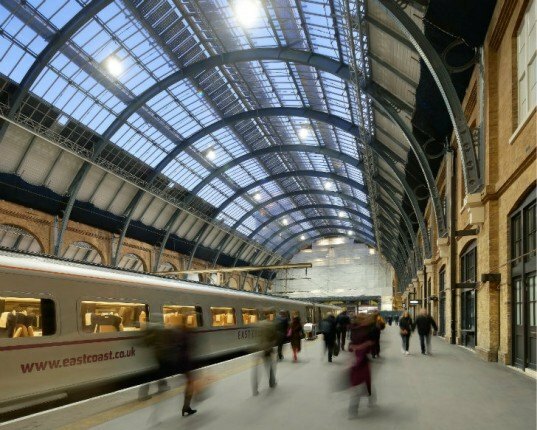 On top of all that, the £500m renovation included improved passenger circulation, a photovoltaic system, and new skylights for the train shed. As the station was originally built in 1852 and listed as a Grade I facility, the facade had to remain fully intact. The renovation had to carefully and creatively restore and keep this intact while opening the space up for passengers and providing room for rail utilities and offices, along with new cafes, bars and retail. The Western Concourse will be the new beating heart of the station when it’s officially opened up to passengers come Monday, March 19th. The free spanning roof emerges next to the historic facade and expands up and over the concourse to provide uninterrupted space to move. Naturally daylit through the translucent ceiling, the room is bright and cheery, a welcome departure from the once gloomy station. Beyond the new construction, the train shed was fully revamped to improve passenger circulation, access and the overall aesthetic. A huge new skylight system over the tracks transforms the space into something bright and welcoming. Network Rail is even making space for Platform 9 3/4 in honor of JK Rowling’s infamous boarding spot for Hogwarts. A rooftop photovoltaic system will generate 10-20% of the stations energy needs as well. As the station was originally built in 1852 and listed as a Grade I facility, the facade had to remain fully intact. The Western Concourse will be the new beating heart of the station when its officially opened up to passengers come Monday, March 19th. The renovation had to carefully and creatively restore and keep this intact while opening the space up for passengers and providing room for rail utilities and offices, along with new cafes, bars and retail. The free spanning roof emerges next to the historic facade and expands up and over the concourse to provide uninterrupted space to move. Naturally daylight through the translucent ceiling, the room is bright and cheery, a welcome departure from the once gloomy station. Beyond the new construction, the train shed was fully revamped to improve passenger circulation, access and the overall aesthetic. A huge new skylight system over the tracks transforms the space into something bright and cheery. Network Rail is even making space for Platform 9 3/4 in honor of JK Rowling's infamous boarding spot for Hogwarts. A rooftop photovoltaic system will generate 10-20% of the stations energy needs as well. 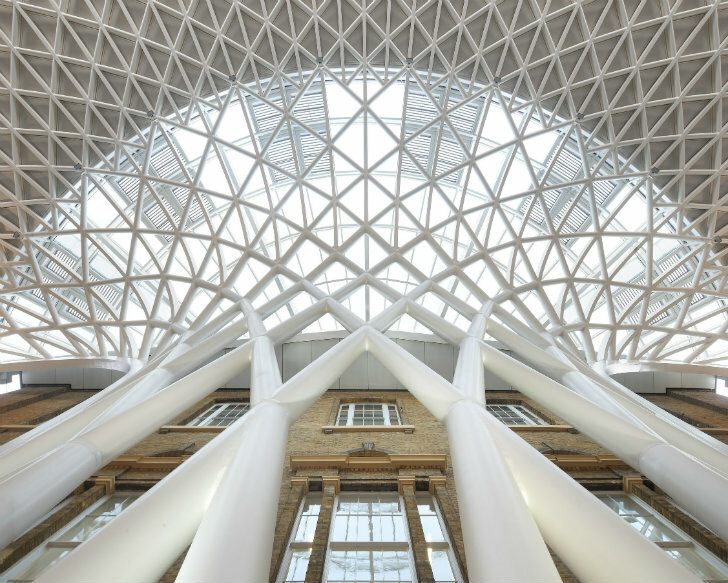 “For the practice, and for me personally, the redevelopment of King’s Cross station isn’t just an exercise in updating an old Victorian railway terminus and creating a vastly improved traveling condition,” said John McAslan. “I believe the reinvention and transformation of King’s Cross station is, quite simply, the most significant piece of place-making in London for many years. " Detail images of the new roof structure. Renovation of the facade and other interior spaces. New rooms and walkways complement the original structure but also make it modern. Aerial view of the new Western Concourse. Renovation plans of King's Cross Station. CAD drawing of Western Concourse roof.